The Ohio country, in the 1790s, was wilderness. A French presence had been removed by a British win in the French and Indian War that ended in 1763. By decree, no white settlements were allowed in the region. At the end of the American Revolution, the area fell into American control and there was no longer a bar to settlement. War vets received land grants, or used bonuses for their service to purchase land. John Ferris (1757-1800), and his wife Elisabeth, left the Ferris-friendly environs of Greenwich, Connecticut, to make a new life in the Ohio country. They first settled in what is now Columbia, Tuscarawas County. Cincinnati Magazine says that they spent a year there, before moving south to what became Blue Ash, Ohio in 1791. During this period, it was recorded, the family had its cabin burned by Indians three times. John served in Captain Richard Greaton’s Company, First Sub-Legion of the United States Army, for a little over two months in 1793. He campaigned under the command of General Anthony Wayne. In later years, General Wayne was appointed Commander-in-Chief of the United States Army by President Washington to subdue the Indians in the northwest territory. Wayne began at once to reorganize the army. 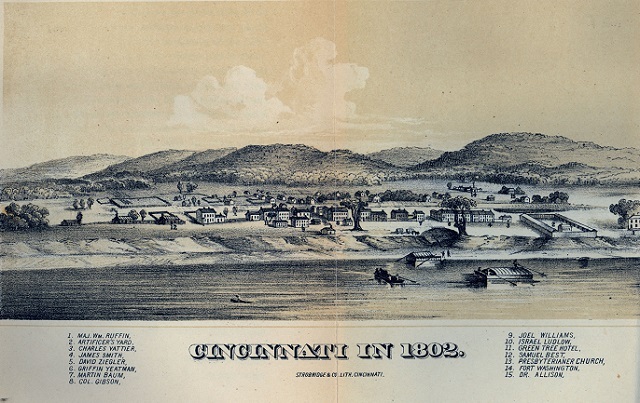 In May 1793, he established his camp at Fort Washington (near the present location of Cincinnati.) He established a camp, Greeneville, in honor of his friend, Nathanael Greene, and another fort, Fort Recovery. After fighting for some time, the Indians in August, 1795, concluded a treaty at Greeneville. Also making the several month long trek to the Ohio country was John’s third cousin, Isaac Ferris (1735-1819), and his wife, Mary Sherwood. They, too, settled in Columbia before moving south (presumably to an area with more settlers and less Indians). The Census records him as living in the town of Cincinnati in 1799. He and his family settled in the vicinity of Duck Creek. The creek parallels the current I77 north to south for about 30 miles where it enters the Ohio River. Isaac was a Baptist. The Duck Creek Baptist Church was founded in 1790 and he was one of the first members and elected deacon. (also known as the Columbia Baptist Church) The church may have been the first formed in the Northwest Territories. These two families have 14 children recorded. While some did not live to adulthood, and others moved on from Ohio, a few remained. I will designate Isaac’s lineage with an [I] and John’s with an [J]. John Ferris (1781-1855) [J] married three times and sired 12 children. Cincinnati Magazine says 15 children. His son, Enoch Ferris (1804-1842) [J], married Lydia Hosbrook and sired six children. Aaron (1807- ) [J], sired seven children and moved to Warren County, Ohio. Alfred (1814-1901) [J] joined him there and fathered eight children. Son David Thompson Ferris (1820- ) [J] married Mary Creager, lived all his life in Hamilton County, Ohio, and had nine children. John Cosbey Ferris (1832-1908) [J] married Angelina Ferris [I], his fifth cousin, and sired 6 children in Hamilton County. Isaac Ferris (1768-1843) [I] and his wife, Elcy Thornell, had eight children in Hamilton County. Ebenezer Ferris (1771-1800) [I] sired three children in Kentucky and is believed to have been killed by Indians while hunting. His son, Isaac Ferris (1794-1860) [I], moved to the Cincinnati area and was the father of five children. His son, Samuel Marsh Ferris (1817-1903) [I], was a prominent Baptist minister. He married Mary Z Ferris, his fourth cousin, once removed. Her father, John Jay Ferris (1787-1857), settled in Linwood, Ohio, in 1812. Samuel had two brothers who also became prominent in Cincinnatti, William Marsh Ferris and John Marsh Ferris. Their mother was, unsurprisingly, Phebe R Marsh. John Ferris (1779-1840) [I] married twice. He fathered 12 children while living in Hamilton County. Abram Ferris (1786-1857) moved to Indiana to live. Smallpox remained a serious threat, though Jenner’s inoculation was in use by some. General Wayne was reported angry at some officers for providing it to their troops without authorization. The various Ferris descendants made their homes in Blue Ash, and in Sycamore, as well as in the city of Cincinnati. By now you have been thoroughly confused by all the names and relationships. Suffice to say that the Ferris lineage in the Ohio country made a difference, and helped open the West. I have been searching Abram Howe Ferris, b: 1786 Greenwich, Fairfield, CT; d: 1810 Ohio; Marr Rebecca Spencer as her 1st husband. Rebecca was b: 9Apr1794 Rupert, Bennington, VT; d: aft. 1810 Ohio, She married 2nd- William Ferris, brother of Abram was b: abt. 1787 Sherburne, Chenango, NY; d: Ohio, thought to have been killed by Indians.Abram’s parents were thought to be Timothy Ferris and Mary and his grandparents were thought to be Japhet Ferris b: 1731, and Hannah Peck. This data is questionable. Rebecca’s parents were Rev John Spencer, Rev War vet, and Rebecca Spencer, John’s 1st cousin. Rev John was a missionary on the Holland Land Purchase and contracted with Connecticut Congregational Missionary Society; the Spencers were living near Jamestown NY. Abram Howe Ferris had 3 siblings of record (there may have been more): William b: abt 1787; Jesse Ferris b: 26 July 1788 Columbus, Chenango, NY; d: 6 May 1864 Smyrna, Chenango, NY married Zeruah Decker; Sally Ferris b: 31 May 1795 @ Sherburne, Chenango NY; d: 27Dec1883 Chautauqua Co NY, married Daniel Benedict b: 1792 Nassau Rennelaer Co NY; d: 1874 Brokenstraw, Waren PA.
Any additions &/or corrections are greatly appreciated. I have been at work on a biography of Rev John Spencer for more than 25 years – he and I share the same immigrant ancestor, arrived Massachusetts 1630. My name is Chris Ferris. I “ Decon” Isaac Ferris is my GGGGGG grandfather. My Father is Steve Ferris, son of Wilbur Isaac Ferris, son of Albert Isaac Ferris, son Of Isaac Clinton Ferris, Son of Ezra Ferris, Son of Isaac Ferris the 2nd, Son of “Decon” Isaac Ferris, son of John Ferris. That’s as far back as I can track my family. I currently live in Columbus Ohio. I’ve been trying to track down my Ferris Realatives for years. Unfortunately most of my direct decendants have passed away. My father and I would love to learn More and meat some of our realatives because as far as we knew, we are it in the area. We are family. My GGGgrandfather was I.C. Ferris born 1819, the Paul Webb Ferris, then I.C. my grandfather, then Paul, my dad. All from Sycamore, Creston, Ohio, as well as Indiana. I can trace it back to Greenwich Conn. and even all the way back to the Norman invasion. Great stuff.